Winner of 50 international awards and Time Magazine's No. 1 Show of the Year, "Matilda the Musical" is a journey into the mind of a 6-year-old girl with a vivid imagination and the gift of telekinesis. Born into a bozo family, her inept parents send her to an awful school run by a sociopathic principal. Matilda finds her only comfort in books and a kindhearted teacher, who helps her find the confidence to take charge of her own destiny. 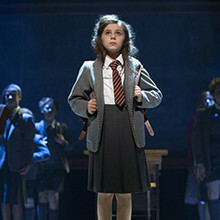 Based on the Roald Dahl children's novel of the same name, the production is adapted by Dennis Kelly and features music and lyrics by Tim Minchin.